Roth DBT-003 review | What Hi-Fi? We like a good price drop. Take this Roth DBT-003, for instance. It was launched two years ago at around £150, but now it can be bought for £80. Sounds like a good time to review it. The DBT-003 is a desktop digital radio; its dimensions (12x30x15cm) and weight (1.71kg) suggest it's designed to be used at home rather than out and about. 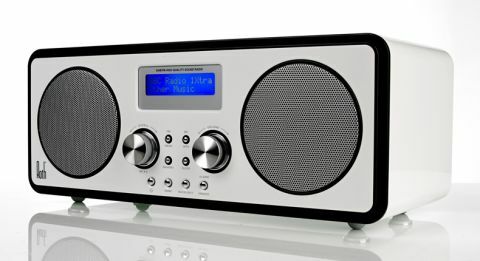 Its features include DAB, DAB+ and FM, as well as inputs via 3.5mm auxiliary and Bluetooth. At the back of the unit, you’ll find a USB port - but this is for charging only. And it’s a handsome device – available in glossy black or white, or walnut. The front has two drivers and clickable buttons between two dials. The one on the left is a dial. You use it to scroll through stations and make selections. The ‘volume’ dial doesn’t spin like a wheel – it twists left or right a smidge before returning to centre. Volume control idiosyncrasies aside, it’s fairly straightforward to switch modes and find stations, and you’ll be listening in no time. It’s weightier and more spacious than the relatively tinny sound of the equally priced Pure Pop Midi with Bluetooth. There’s a decent amount of detail. Sadly this is outweighed by the lack of balance. It’s a boomy sound, with thick bass hogging your attention. Songs thump along without any sense of refinement, and it’s hard to pick out much nuance. The price drop helps of course, but still, the Roth DBT-003 could sound better. It’s a smart-looking machine and its list of features is impressive. But the volume control can be awkward to use, and ultimately the sound isn’t great.